Director Georges Franju may not regard his 1960 Eyes Without a Face as a horror film, but it seems pointless to deny that there is no more appropriate genre classification that that. The Criterion Collection has done an exemplary job of restoring this nightmarish vision of a doctor attempting to restore his daughter’s damaged face. As Christiane, Edith Scob’s face is obscured for most of Eyes, hidden behind an eerily expressionless mask. Through her eyes and body language, Scob carefully conveys the sorrow of a woman left with a hideously scarred face (caused by a car accident). She has more or less given up on hopes of living a normal public life. 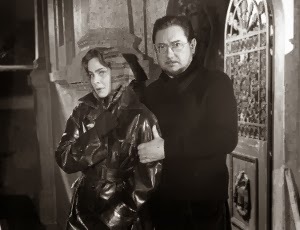 But Christiane’s father, Dr. Génessier (Pierre Brasseur), will stop at nothing – not even murder – to find her a new face. It’s a father’s love taken to horrifying extremes. Génessier is assisted by Louise (Alida Valli, a Jessica Lange lookalike if there ever was one), who dotes on Christiane sympathetically, all while prowling for young women upon whom the doctor can operate. While not extremely graphic by today’s standards in terms of pure gore, the “facelift” surgery is still pretty squirm-inducing (the doctor literally lifts the captive woman’s face right off in order to graft it onto his daughter). Christiane is such a lost soul, we don’t really know initially how she feels about her father’s series of ultimately failed attempts to restore her appearance. The doctor experiments on various dogs he keeps in a kennel in his basement. Our first real indication that Christiane is rediscovering her conscience arrives during a scene in which she tenderly spends some time with the dogs, who of course are not scared of her unusual appearance. The doctor and his practically-zombified “nurse” Louise are admittedly underdeveloped as characters. The doctor’s obsession is ultimately a self-centered pursuit, a sickeningly unethical extension of the “my family above all else” ethos. Eyes Without a Face is basically an artsy exploitation film, a French art house variation on the “mad scientist” horror subgenre (and a relatively early exploration of the body horror subgenre). Maurice Jarre’s bizarre, garish score helps add to the mildly surreal vibe. Franju takes the material seriously though, not looking for cheap “gotcha” thrills. He seeks to unnerve and largely succeeds. In addition to the B&W cinematography looking terrific due to a careful clean up and transfer of the original camera negative, Criterion offers a simple but effective uncompressed mono soundtrack. For supplements, they’ve included a number of concise interviews (with director Franju, star Scob, and screenwriters Pierre Boileau and Thomas Narcejac). There’s also a 1949 documentary (also directed by Georges Franju, his first film) Blood of the Beasts. Typical of Criterion Collection titles, the booklet is a feature in and of itself, this one featuring essays by novelist Patrick McGrath and film historian David Kalat. 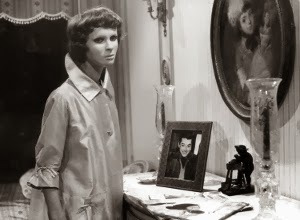 Eyes Without a Face definitely makes for memorable Halloween season viewing.